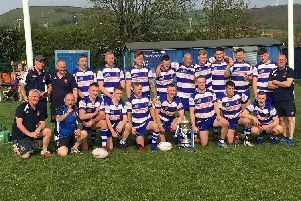 Barkisland maintained their much-improved form with victory in yesterday’s Calderdale derby at Elland in the Huddersfield League. Many local games were hit by a spell of heavy rain around the time of the tea interval and 10 overs were lost at Hullen Edge. Barkisland made 179-9 and Elland, chasing a revised target of 150 off 40 overs, were bowled out for 125 in the Championship game. Three of Elland’s top four made double figures, headed by Liam Fletcher (48) and ex-Barkisland skipper Paul Winrow (22), but the rest failed as Matthew Steers and Darren Robinson, the current captain at the Scammonden Road club, picked up three inexpensive wickets each. Barkisland moved level on 32 points in fourth place with Rastrick, who lost by 86 runs at Skelmanthorpe. The home side batted fairly solidly to reach 207-7, with Asif Hooper’s 45 the top contribution, and the Round Hill men managed only 121 in reply. Ovais Hussain was out to the second ball of the innings and only overseas player Asif Afridi (28), skipper Jacob Waterson (33) and Matthew Lambert (22) made double figures in reply. Lightcliffe suffered at the hands of Yorkshire’s James Logan as Farsley romped to a 183-run win at Wakefield Road in the Bradford League’s Premier Division. Logan made 118 as his side rattled up 343-4 and then took five wickets with his spin bowling. He figured in a century stand with fellow Headingley player James Wainman (65) to put Matt Baxter’s men on the back foot and then a third wicket stand of 152 with skipper Ryan Cooper. Suleman Khan took 3-103 but the overseas player was run out for a duck as Lightcliffe replied with 160. Openers Alex Stead and Josh Wheatley put on 61 with 30 runs apiece before three quick wickets undermined the response. Farsley’s total was the top score of the day in the league and Northowram Fields’ John Lister made the best individual score of 147. The skipper struck three sixes and 23 fours and shared in a fourth-wicket stand of 220 with youngster Kyle Welsh (91) as Northowram Fields piled up 311-6. Unfortunately for the luckless Rams the Championship Two game was at Hopton Mills, Mirfield and the pair’s efforts went unrewarded as it was the only first team match in the league not to have a winner. The match was halted with Hopton Mills on 180-8. As they had not received the same number of overs as Northowram each team got three points for an incomplete match plus bonus points. Brighouse made it five wins from six league games - not including one abandonment - with a 150-run success at home to Spen Victoria. The loss of both openers with the score on 11 didn’t stop them amassing 316-7 with Sabar Sarwant (79), Sohail Hussain (48), Asad Mahmood (42) and Mohammed Waseem (48no) taking a toll on the visiting attack. Sarwant then took 5-26 while overseas player Deron Greaves had the key wicket of Ollie Davison (56) in his 3-19 as Spen were dismissed for 166. Todmorden’s Worsley Cup quarter-final against Ramsbottom at Centre Vale will be replayed next Saturday after the game was abandoned yesterday. Andrew Sutcliffe’s side were 95-3 in the 23rd over with pro Chris Schofield 37 not out, Matt Burdaky having taken the wickets, when the heavens opened. Tod had suffered a first T20 defeat in their third group outing at Rochdale on Friday. Matt Collins bowled superbly to take 4-7 off four overs as Rochdale made 124-9. Openers Ben Pearson (25 off 18) and Schofield (29 off 34) put on 47 before the visitors lost their way. Kai Abbas made 34 off 22 but the rest found it harder going and there was a 10-ball duck for Bilal Abbas as Tod fell six runs short of victory at 119-6. Walsden also have two wins out of three after a seven-wicket success at Littleborough. The hosts had no answer to Sri Lankan Umesh Karunaratne (5-7 off four) and were dismissed for 89. Walsden completed victory in the 12th over after skipper Stevie Barker had made a run-a-ball 28 at the top of the order.